Signed bottom right: André; date on back in gouache: July 1953; dedicated in center: For Elisa. 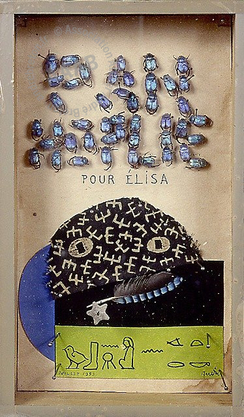 Labelled with a note in André Breton's writing : This poem-object should be read "PAN-(H)OPLIE for Elisa (Day and night) I radiate with love for you" (this last line is in Egyptian hieroglyphics taken from a document reproduced in C.W. Ceram : Des dieux, des tombeaux, des savants, page 104). 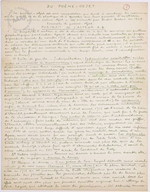 Signed : André Breton. "The history of modern poetry since Romanticism has been the history of poets responding to the absence of a universal, eternal code. Like other modern poets, André Breton searched, not for the impossible reconstruction of an impossible code, but for the remaining vestiges of the supreme science, the universal analogy. He looked in the lost traditions and wisdom of native people, in the buried syllables of heterodoxy and criticism. Finally, and above all, he looked for them in his interior world, in the passions, emotions, and images that engender desire, a power no less universal than reason. He tried to hear the confused words let out at times by the forest of symbols over the tumult of contemporary history. We, the moderns, have made our songs out of these uncertain words. Breton's poem-objects are made of the same material as his other poems. His poems are made of fog and tall obelisks tattooed with lightning. But his poems are also made of everyday objects: an invitation to a private viewing, a ribbon holding back a woman’s curls. They are both street talk and dream language. In the Baroque emblem, image and figure naturally transform into language. In Breton’s object-poem, this rational, metaphysical concurrence no longer works; the syntax is different; the poem is made up of contrasts and disjunction, of flaws and perilous jumps. But what it loses in intelligibility, it gains in surprise and invention. 8 x 4 3/4 x 2 in.